After the first year of the IAAF Hammer Challenge, reviews were bad. Athletes, coaches, and commentators have all spoken out about how the opportunities for hammer throwers were reduced last year under the new system. Previously, the hammer throw was included in many of the world’s top one day meetings. After those meeting joined the new Diamond League, they cut the hammer from the new program. * The IAAF then set up the IAAF Hammer Challenge to help accomodate the event by adding it to some smaller events, but offering it a reduced amount of prize money. 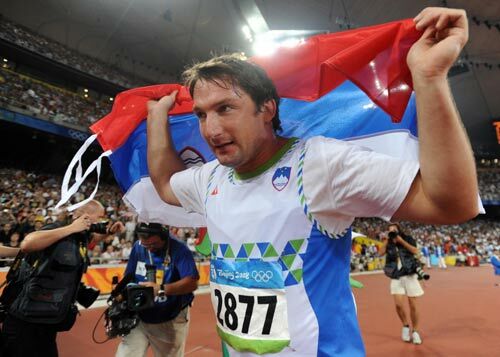 Hopefully the return of Olympic champion Primož Kozmus from retirement can help resuscitate the men's hammer throw. I was hoping to hear today that the IAAF decided to remedy this problem at today’s IAAF council meeting. Instead, they reduced the number of meets included in next year’s IAAF Hammer Challenge. While the women will still have eight events, the men will be reduced from seven to five events over the course of the season. Fewer meets means it will be even harder for elite throwers to make a living. Along with the world championships, there will only be six hammer meets offering a decent paycheck for male hammer throwers (and by decent, I am being liberal with the term since a $2,000 first prize at a Hammer Challenge event will hardly pay the bills). In reality, only the top few throwers in the world would be able to be a “professional” and truly make a living at the event without the assistance of their national federations. In announcing the change, the IAAF was pleased to note that “The Hammer throw Challenge was created in 2010 when it was found out that this discipline was the only one which was not included in the new Diamond League concept.” While the statement makes the IAAF sound altruistic, it is quite the contrary since the IAAF has significant influence with the Diamond League and was involved with the decision to exclude the hammer in the first place. Furthermore, they could have better fixed the situation by setting up a better alternative circuit that made it possible for hammer throwers to compete at more high level competitions and earn some more money in the process. The one good thing about this announcement is that the women’s hammer throw will not be cut back. The event was exciting this year and that has shown through by the fact that many of the competitions that hosted only a men’s event last year will switch to the women’s hammer throw in 2011. With a new world record and great battles between Anita Wlodarcyk, Betty Heidler, and Tatyana Lysenko, there was plenty of excitement at nearly every meet. The men’s hammer throw lacked that star power, but it should return in 2011 since Primož Kozmus is planning on coming out of retirement under the guidance of a new coach. Hopefully he can help reverse the trend. *Note: While the hammer throw is not part of the Diamond League program, the Prefontaine Classic did go out of its way to add the women’s hammer throw as a non-Diamond League event at this year’s meet. It was the only Diamond League meet to do so and those lucky enough to attend saw a great competition and the furthest throw ever on American soil. The Oregon student newspaper even led it’s recap of the meet with the hammer throw. So Athens and Berlin are the meets dropping out, with Madrid and Hengelo hopping from the men’s column to the women’s. I have to wonder if Athens isn’t having financial difficulties anyway. No idea what’s up with Berlin. Looking at the Hammer Challenge in isolation is a little odd, of course, since the most memorable senior hammer competition I saw in 2010 was at a Diamond League meet (Pre Classic’s Heidler/Wlodarczyk duel). Good point about Athens. I’m surprised Berlin is dropping the hammer since their meet did well this year (Rudisha’s 800m WR) and Heidler is a big crowd favorite. And you are right, the Pre Classic was probably the best meet of the year. However, that and the Continental Cup were the only big pay meets outside of the Hammer Challenge (although there are a few good throwers only meets out there). Hopefully Pre will continue to host the men’s or women’s hammer in 2011. Is it the prize money that matters? I would think it would be the media coverage that would make somebody want to put their name on your shirt. I pray that Usain Bolt starts throwing the hammer. 2011: Koji vs. Primož. If that’s not enticing, then nothing is. Your Usain Bolt idea has been tried on a local level in Quebec Canada. At a year end Canadian 100 meter record man (9.86 I think), and 4 x 100m world champion Bruni Surin threw hammer to bring in the media. Could have brought in James Steacy, Sultana Frizell, Jennifer Joyce… but no. They brought in a guy who threw less than 25 meters, from winds. Sad thing is they did get some publicity, and as great as the above mentioned throwers are nobody outside track cicrles knew of them at the time.